Classic British Punk Rock - raw, live, and exciting. Enjoy the filth, the fury, and the thrill. Punk is back. Anarchy is back. Join us: united we are punk by numbers. Together we will spread the disease! 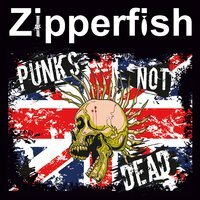 Zipperfish is a modern British punk rock band with a classic sound. The filth, the fury, the snarls and swagger, are back - but this time live! Punk's Not Dead is a raw, exciting, live Zipperfish show featuring 12 incredible punk rock songs - including material from the band's debut album, "Punk by Numbers", and never before released songs. "You guys are fantastic! Good to know someone's carrying on the torch of genuine punk rock!" "Takes me back to SLF, Adicts and UK Subs. I love the snotty Brtish punk."